Here are the numbers. 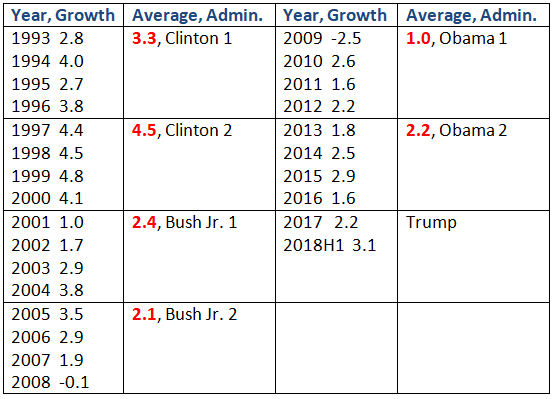 The most dynamic were 8 years of the Bill (5 yrs of 4% or higher growth), the most pathetic were 8 years of "hope and change" (zero year of 3% or higher growth). Bush Jr. 1 started with 9/11 attacks in 2001, then ended with the start of US finance turmoil in 2008. Still it has 2 years of above 3% growth. Obama inherited only the 2009 continuation of US financial turmoil. 2010-2011 were already recovery years and Obama blew it, normally recovery yrs are 3%+ even 4%+ growth. 8 yrs of "hope and change" were actually 8 yrs of high bureaucracies, high energy taxes. If Hillary! Hillary! Hillaaarrrryyyyy! became President, the pathetic growth of "hope and change" would have continued. People should distinguish between personality and public policy. Hate or love the person but focus on policy -- tax cut or retain high taxes? zero tariff or high tariffs? strictly control illegal immigration or be lax on it? support coal power or kill it? send more money to UN climate journey or stop it? These are clear policy debates answerable by Yes or No depending on one's belief in markets or not. Meanwhile, these news reports would give more context to the above numbers.